Sharon J's Writing Blog: At Last! Bring Out The Booze! Bring out the cake, Minx, and get those knees up, Debs, cos we're gonna party! Anybody else coming? Sue? Karen? You two have to be up for a party! And no excuses about moving, Sue! 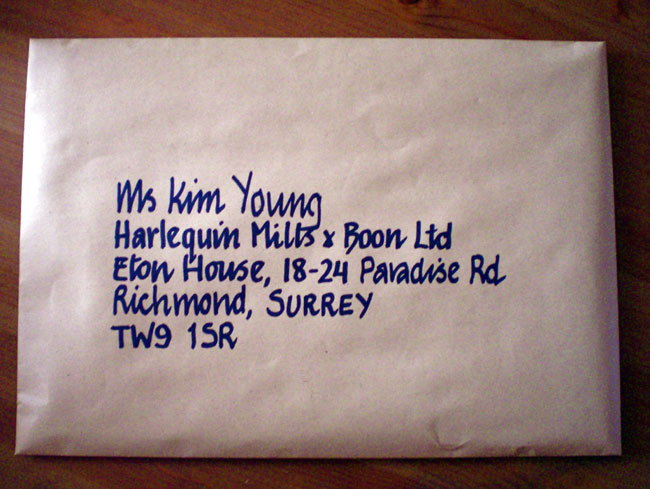 Seriously, the first three chapters of Leo & Sherry's story are now at the HMB offices in Richmond (unless the post office hasn't done its job properly, that is). I think I did everything right... manuscript in double spacing courier 12 without any kind of binding except an elastic band around both it and the cover page along with a cover letter, synopsis and an SASE. The envelope didn't have any stamps on it when the photo was taken (the things you do for prosperity, eh?) because Richard put them on when he took it to the post office (and on the SASE, of course, otherwise it wouldn’t actually be one), but it didn't cost quite as much to send as I'd imagined. I was envisaging having to take out a loan in order to cover the cost of posting manuscripts but no, £1.97 or something like that I believe. I can live with that. So now it's time to forget about Sherry and Leo and get on with Darcie and Alex's story. I'm actually enjoying their story much more, I think probably because I really like Darcie. The story's much better paced, too. Sherry never really 'took off' for me, I think because I had to change her when I changed the story from a 'Presents' to a 'Tender', but never mind, she's gone now so no point giving her any more thought. I'm aiming to have the first draft of Darcie and Alex finished by mid August but that's going to depend on how much time I get while my daughter's visiting in July. I can't exactly spend all my time with my nose in the computer and just leave her to get bored, can I? We'll see. If it isn't finished by the time we go on holiday then I shall take my laptop with me. Yes, I know holidays aren't meant to be for working but I usually spend some time holed up in the caravan whilst waiting for my pump to finish (I'm an intravenous feeder on TPN, for those who don't already know) so I might just as well write for a while. And anyway, until you get paid for it, it isn't really work, is it? Right. I'm off to accompany Darcie, Alex and Jack (Alex's son) around a Welsh castle. I just hope it doesn't rain. There are actually two links today. One I lifted from Amanda Ashby's blog but the other's been residing in the NWG links directory for a while now. Being as they're both sort of related to sending off manuscripts (you send them off and then you wait...) I thought it'd be suitable as today's link. Both are chock full of authors telling their stories of the day they got THE CALL. Woohoo, Sharon! Congratulations on sending it off! I wish you the best of luck and a timely response begging for more. Elsa! How lovely to see you here! I had no idea you read my writing blog. I trust you're keeping well in Estonia? Eva. Thanks but I'm really not expecting them to ask for a complete. I'm not entirely happy with the manuscript (it was changing it from a Presents to a Tender that blew it for me) but rather than spend time re-writing it (again) I decided to send it as it was and get on with Darcie & Alex instead. For me, actually finishing an entire book was a goal in itself. I like the fact you took a picture of it before you shipped it off. I hope you hear a response soon and don't have to wait long. And good luck taking on Darcie and Alex's story! Congratulations on sending your chapters off, Sharon and welcome to the obsessional world of wondering if the postman is stealing your mail. You should start feeling the full symptoms in a few weeks!!! I promise I'll try to behave better than I did at Minx's bash, when I spent most of it under a bush, only coming out to find the world had moved on without me. Rest assured, I'm in this one for the duration! Congratulations Sharon - and good luck with the submission! Let me know if you hear any news - good or bad. PS You do know that you're unlikely to actually get Kim Young to read it unless it's her turn for the unsolicited mansucripts? But whoever reads it will be qualified to judge mss from all the lines. I hope it's not too long until you hear - and that you get good news. Oh yes, I'm always up for a party ('specially if it gets me away from packing). I haven't felt that feeling for over 12 yrs now (submitting mss to HMB), but I can remember it all. My stomach used to be in knots for the next couple of months while I stalked the postman! I didn't know about TPN - is that something you have to do every day? (What's your dx, if you don't mind me asking). When do you go on holiday? You never know, I might have my first, first draft written by the time you finish your second! Send, and move on to the next one! Have I got to bake again? Oh God, knew I should have stayed at staff meeting a bit longer but I'll crack open a special bottle with your name on it! Even the envelope looked exciting-- I'm sure that must bode very well for the manuscript inside it! So, anyone for a game of I Spy while we all wait here for news?? Glad you could all make it. All that booze has left me with a dreadful head this morning but who cares - you only live once, right? Karen. I had to take the picture to remind myself that I had really done it. You never know, in 6 months from now, if I still haven't heard anything, I may start wondering whether I actually dreamt I sent it. Amanda. I don't think I'll get to the point where I start stalking the postman but that could change. Watch this space! Debi. You were under a bush? Shame on you, hussy! Kate. I most certainly will let you know. The whole darned world will know, good or bad. 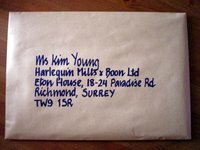 As for Kim Young, I've no idea who she is, I simply addressed the ms to who I was told to, like the good girl I am ;-) Just as long as somebody reads it, I'm not fussed who. Sue. Dx? I take it you mean diagnosis? Hmm... long story. I'll make a post about it rather than write it here. We go away in August for a week in a caravan in Weymouth! Weyhey! It's an annual family tradition only Dad has dementia now so he can't come and neither can Mum because she has to look after him. Minx. Let's pretend most of the guests are on diets so you can get out of baking, eh?